July and August 2004 — At the height of the summer season, when New Englanders and thousands of tourists open their wallets to buy fresh “steamers” and fried clam strips, Maine’s shellfish beds are shut down. Concerned by the worst bloom of toxic algae in 23 years, resource managers closed the flats for fear of paralytic shellfish poisoning. Hundreds of shellfishermen went without income for nearly two months at a time when they typically fill their bushel baskets and wallets. From Nova Scotia to Cape Cod, restaurateurs watched the price of clams jump by 200 percent. All of this was caused by a tiny microscopic organism, Alexandrium, which does not harm the clams but can sicken or kill humans who eat the shellfish. Millions of microscopic plant cells thrive in nearly every drop of coastal seawater. Algae (phytoplankton) are the primary energy producers in the ocean, forming the base of the marine food chain. In the presence of sunlight and a sufficient bath of nutrients, these single-celled plants photosynthesize and multiply, creating a “bloom” that feeds everything from fellow microbes to great fishes. Among the thousands of species of algae in the sea, a few dozen produce toxins and pose a formidable natural hazard. Sometimes they reproduce prolifically, discolor the water, and foul beaches with foam from their prodigious population booms. Other times these harmful algae are dilute and invisible, nearly inconspicuous if not for the destruction they cause. 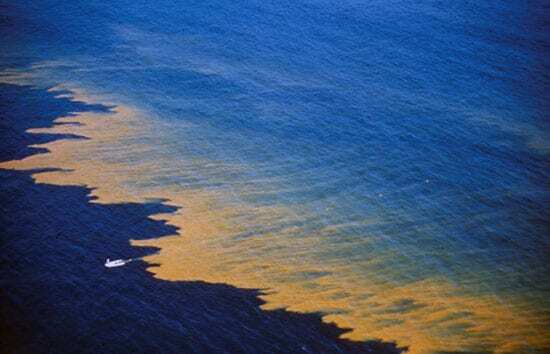 A bloom of harmful algae can completely and permanently alter the structure of a food chain, causing massive die-offs of shellfish, marine mammals, fish, seabirds, and other animals that consume them. They can sicken, disable, or kill humans. medical treatment of exposed populations. Harmful algal blooms are natural and they are not new. But ocean scientists are growing concerned that they are now all too common. The unprecedented growth of human activities in coastal watersheds—including agriculture, aquaculture, industry, housing, and recreation—has drastically increased the amount of fertilizer flowing into coastal waters and fueled unwanted algal growth. Red tides have been known throughout recorded history, but the nature of the global problem in estuaries and coastal waters has changed considerably over the last several decades, both in extent and in public perception. Virtually every coastal country is threatened by multiple harmful or toxic algal species. Bloom events can cover areas as small as a coastal pond or as large as one million football fields (more than 1,000 square miles). These blooms of algae are popularly known as “red tides,” since the tiny plants can sometimes increase in such abundance that they change the color of the water with their pigments. The term is misleading because non-toxic species also can bloom and discolor the water, and other species are incredibly toxic even when concentrations are low and the water seems clear. Given the confusion surrounding the meaning of “red tide,” the scientific community prefers the term harmful algal bloom, or HAB. One cause for the increasing frequency of HAB events seems to be nutrient enrichment—that is, too much “food” for the algae. Just as the application of fertilizer to lawns can enhance grass growth, marine algae grow in response to nutrient inputs from domestic, agricultural, and industrial runoff. Nutrient enrichment leads to excessive production of organic matter (including HABs) and a reduction in the amount of life-giving oxygen dissolved in the water, a process known as eutrophication. Fall 1972 — Over Labor Day weekend, Tropical Storm Carrie blows into New England and becomes a Nor’easter, battering the coast with heavy winds and rain. Unbeknownst to scientists, cells of Alexandrium fundyense (algae native to the Bay of Fundy) are washed south and west by currents stirred by the storm. Several weeks after Carrie, a massive bloom of shellfish-poisoning algae blankets the waters of New England. Before 1972, toxins associated with A. fundyense had not been recorded in western New England waters; since then, that species has bloomed nearly every year. Algae usually reproduce by asexual fission: One cell grows and then divides into two cells, then two into four, four into eight, and so on. When growth is unchecked by environmental conditions—such as grazing by animals or a shortage of nutrients or light—harmful algae populations can accumulate to visually spectacular but catastrophic levels. For some species, a decline in available nutrients provokes a switch to sexual reproduction and a new life stage. 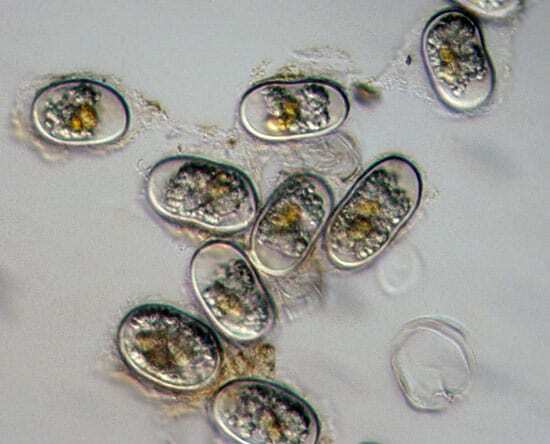 When they sense that their boom times are coming to an end, the algae form thick-walled, dormant cells called cysts that settle to bottom sediments. These cysts can survive for years, allowing a species to withstand nutrient starvation, extreme winter temperatures, or even ingestion by animals. When favorable conditions resume, the cysts rupture, germinate, and populate the water column with a new generation of photosynthetically active cells primed for another bloom. The cyst stage represents an effective strategy for survival and dispersal. With every switch into the cyst stage, a bloom can be carried into new waters by ocean currents, fish, or even humans (via ballast water discharge) and then deposited as a “seed” population that colonizes a new area. 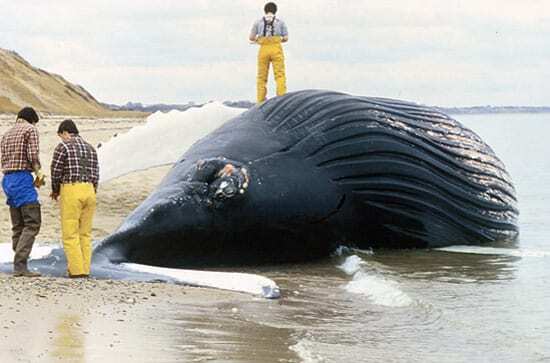 November 1987 — Over a five-week span, 19 humpback whales die in Cape Cod Bay, Massachusetts, a die-off equivalent to 50 years of natural mortality. Unlike stranding events, where seemingly healthy whales swim into shallow water and beach themselves, these humpbacks were dying at sea and washing ashore. Post-mortem examinations showed that the whales had been healthy immediately prior to their deaths; no lesions or infectious pathogens were detected; and many whales had fish in their stomachs as evidence of recent feeding. Alarmed and saddened by the mysterious deaths, the public and the press speculated that they were caused by pollution. Scientists later discovered that the whales had consumed mackerel with an abundance of algal toxins stored in their flesh. Algal blooms can have an impact even if whales, wild fish, seabirds, and other animals do not consume the microscopic cells. Some algae release their toxins and other compounds into the water, killing creatures through direct exposure. Carnivorous fishes and mammals sometimes die from the cumulative effects of consuming smaller fish or zooplankton containing toxins. Other HABs kill without toxins. The species Chaetoceros has been associated with the deaths of farmed salmon, yet these tiny plants do not produce a toxin at all. Instead they have long, barbed spines that lodge in fish gills, causing a buildup of mucus, degeneration of the respiratory system, and eventual death by suffocation. Some blooms deplete the resources needed by marine creatures. For instance, when a massive bloom begins to decay, the dying and decomposing algae consume the available oxygen, suffocating other plants and animals or forcing them to migrate. Prolonged blooms of non-toxic algae also can reduce light penetration to the bottom, decreasing the density of aquatic vegetation and grass beds that serve as nurseries for commercially important fish and shellfish. Blooms of macroalgae (seaweeds) have also increased along the world’s coastlines, and they often last longer than typical phytoplankton blooms. Once established, macroalgae can dominate an ecosystem for years and are particularly harmful to coral reefs. Under the right conditions, opportunistic seaweeds outcompete, overgrow, and replace the coral. These chronic impacts can affect the structure and function of entire ecosystems. The mass die-off of adult fish not only depletes the current population, it prevents breeding-age fishes from reproducing. Larvae or juvenile fish can be stunted or killed, preventing the next generation from reaching maturity. Such ecosystem degradation likely has long-term consequences for the sustainability or recovery of populations of animals further up the food chain. A population of marine mammals might not grow or reproduce because their main food source has been depleted by HABs. Many researchers now believe that such ecosystem-level effects from HABs are more pervasive than we realize. 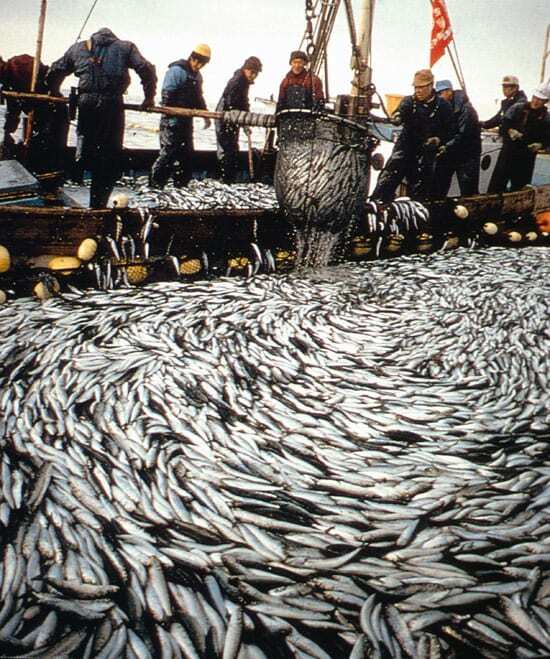 February to April 1998 — In Hong Kong, where one-third of all finfish consumed comes from fish farms, a devastating HAB wipes out half of the country’s annual aquaculture fish stocks. More than 1,500 tons of fish are killed by an alga called Karenia digitatum. Direct losses are estimated to be HK$250 million ($32 million U.S.). Other fish prices plummet as consumers avoid seafood altogether. A government official calls it the “worst natural disaster” ever to hit Hong Kong. HABs can take a variety of forms, each with a distinct and disturbing impact on human health. Shellfish poisoning — Most shellfish filter seawater for food. As they eat, they sometimes consume toxic phytoplankton and the algal toxins accumulate in their flesh. The level of toxins can reach a threshold where they become dangerous—sometimes lethal—to humans and other animals, though not to the shellfish themselves. Shellfish poisoning syndromes can cause gastrointestinal and neurological problems, from nausea, vomiting, and incapacitating diarrhea to dizziness, disorientation, amnesia and permanent memory loss, and paralysis. Some syndromes are lethal. Ciguatera fish poisoning — Species of the genus Gambierdiscus living in tropical waters (particularly coral reef communities) are known to produce a fat-soluble toxin that causes diarrhea, vomiting, and abdominal pain, followed by muscular aches, dizziness, anxiety, sweating, and tingling sensations. Ciguatoxin-producing algae live attached to seaweeds, and they are first consumed by plant-eating reef fishes. Those fish are in turn eaten by larger carnivorous, commercially valuable finfish. The toxin, being fat soluble, is transferred and magnified through the food chain, much as occurs with pollutants such as DDT and PCBs. That means the most dangerous fish to eat are the largest, oldest, and most desirable. Ciguatera is responsible for more human illnesses—10,000 to 50,000 cases annually—than any other kind of toxicity originating in fresh seafood. Possible Estuary-Associated Syndrome — This vague term reflects the poor state of knowledge of the human health effects of the alga Pfiesteria piscicida and related organisms. Human exposure to these algae in estuaries has been linked to deficiencies in learning and memory, skin lesions, eye irritation, and acute respiratory distress. In 1997, a bloom of Pfiesteria caused massive fish die-offs on Maryland’s eastern shore, leading consumers to avoid all seafood from the region despite assurances that no toxins had been detected in seafood products. That single event cost at least $50 million in lost seafood sales and lost revenues for recreational boat charters. January and February 2002 — Seafarers and satellites notice something amiss in the Gulf of Mexico. The seas north and west of the Florida Keys have grown dark, with nearly 700 square miles of water (two-thirds the size of Rhode Island) taking on the color of black ink. Tests show this “black water” has normal salinity and oxygen levels, but researchers suspect an unusual, non-toxic algae bloom. There are none of the usual signs of a HAB, but fishermen note that the black water seems to be devoid of fish. Researchers call the recent expansion of HABs an “apparent” trend because for many locations, poor historic data are available. It is not clear whether the increase in HAB reports reflects heightened scientific awareness of coastal waters and scrutiny of seafood quality, or a real increase in the number, severity, or frequency of outbreaks due to pollution and global change. Researchers suspect that many “new” bloom species are simply “hidden flora” that had existed in those waters for many years. Such species had not been detected or recognized as harmful until scientists had developed more sensitive toxin detection methods and trained more observers, or until aquaculturists had placed shellfish or fish resources in areas where toxic species had been lurking. That part of the expansion may be a result of increased awareness should not negate our concern, nor should it alter the manner in which we mobilize resources to attack it. The fact that harmful algal blooms are at least partly due to human activities makes our concerns even more urgent. In the winter of 2002, satellites and sailors observed waters in Florida Bay turning the color of black ink. Researchers speculated that the mysterious “black water” was a bloom of algae, though there were none of the typical signs of toxins or oxygen depletion and no observed die-offs of marine life. Fishermen noted that they found few fish within the region.